Check out over 90 images, links and much more info by reading on. Check out the photos from the Gecco booth at San Diego Comic-Con 2015. They had an assortment of new and previously released statues at the show. You can check out a few of their excellent Metal Gear Solid V statues, including the stunning White Armor Raiden, which was an exclusive for the show. They had their first Bloodborne Hunter 1/6 Scale Statue on display, which was announced right before SDCC 2015. At the show they announced a new Ultraman statue. You can find a few shots of the new Ultraman sculpt here as well. It’s still a work in progress, but it’s already looking impressive. Read on to see the new items as well as some of their previously released states for Silent Hill, Naruto and more. Today we have a review and gallery of Gecco Collectibles fantastic Metal Gear Solid V: Ground Zeroes – Snake 1/6 Scale Statue. 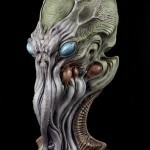 The statue, which was released in Japan in March, is coming to comic and specialty shops soon for an official North American release.The statue stands a little over 12″ tall and is made of PVC. 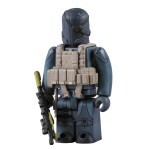 Snake feature three swappable heads, an interchangeable suppressor for the assault rifle, and a themed base. It’s priced at $198. Gecco was kind enough to send along a Snake Statue for Toyark to review, and I have over 55 high resolution photos for you to check out. After the jump, you can see the gallery as well as my review of the statue. 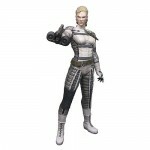 Video game blog Kotaku has posted some shots of the upcoming Metal Gear Solid Peacewalker figures. 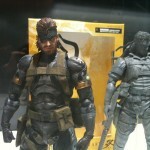 The figures include Snake and the bosses and will be released this summer in Japan, Snake in June and the bosses later. They are being released under Square Enix’s Play Arts line. We have some new, clear photos courtesy of Timeless Dimension. Medicom has revealed two new Vinyl Collectible Dolls (VCD) Naked Snake figures. 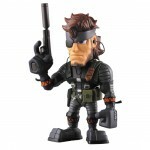 These stylized figures are based on Snake from the Metal Gear Solid series of video games. there are two version. A standard painted version, and a clear “stealth camouflage” version”. You can see the figures by clicking the headline of the story. Entertainment Earth is set to carry the highly anticipated Metal Gear figure from Medicom Toys. The figures stand 7 inches tall and come with accessories. All figures are scheduled for release this September for a price of $18.99. You can see images of all four Metal Gear figures by clicking the headline of the story. 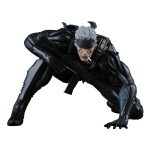 Medicom has put up a pre-order for a new Snake from their Metal Gear line. 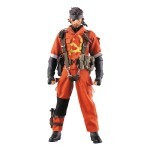 This one is a Cold War version of Naked Snake for their Real Action Hero line. The figure stands 300 MM tall (about 12 inches) and will sell for 17,640 Yen (about $180 USD). The figure is scheduled for release this September, with a run limited to 1000 total pieces. You can view the listing page Here. You can see a few images by clicking the headline of the story. Medicom Toys has unveiled a bunch of new toys based on the popular Metal Gear Solid franchise. Here we have a series of five figures, all based on characters from the various games in the series. Sure to be a hit with fans of the series as well a Medicom fanatics, the figures are highly detailed and very accurate. the figures will all retail for 3,675 Yen (about $37 USD). We have mirrored the images. They can be seen by clicking the headline of the story. Medicom Toys has unveiled a bunch of news toys based on the insanely popular Metal Gear Solid franchise. First up is a set of six kubricks that span the gamut from the first Metal Gear Solid all the way through Metal Gear Solid 4.